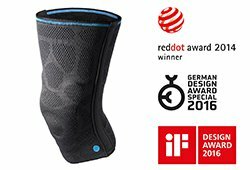 The Dynamics Plus knee support has again won awards for its outstanding product design: the Good Design Award 2015 and the If Design Award 2016. Ofa Bamberg are delighted at receiving to date a total of five awards for products in its Premium Orthopedic Support range, Dynamics Plus. And as a company, the medical aids manufacturer was also nominated for its brand management for the German Brand award. For its functional extras, which fuse harmoniously with the design, the Dynamics Plus knee support already received the Red Dot Award 2014 and the German Design Award 2016 with Special Mention. These are now followed by further internationally renowned prizes: the American Good Design Award, claimed by their own account to be the oldest design competition in the world, as well as the If Design Award. The Dynamics Plus knee support due to its organic honeycomb structure aims to break with the traditional aesthetic standards of medical products. Similarly, the product developers wanted to set new standards in the product’s functionality – with the specially formed Plus pad for a reinforced massaging effect and with its unique comfort zone. Its patented Arthroflex knitted fabric in the comfort zone consists of two wafer-thin layers that move in opposite directions and thus minimize wrinkling in the hollow of the knee. This technology is a distinguishing characteristic of all orthopedic supports within the Dynamics Plus range, including the elbow support, which in 2015 received the Red Dot Award. In 2016 Ofa Bamberg as a whole now also has the opportunity to win an award – with the nomination for the German Brand Award. The Committee for Design and the German Brand Institute have invited the company because of its brand management to compete in the category “Industry Excellence in Branding”.